﻿ Snook's Dream Cars - Ohio. Find It Here. A Classic Car museum with great personality and interesting details. This gem of an attraction features car models from the 1930s to the 1960s, including coupes, convertibles, sedans, roadsters and racecars, made by Cadillac, Ford, Chevrolet, Buick, Pontiac, Packard, Kaiser, Willys, Jaguar, Triumph, MG and Lotus. A vast collection of gas and ornament memorabilia is another great feature as are the painted murals depicting American life through the years. 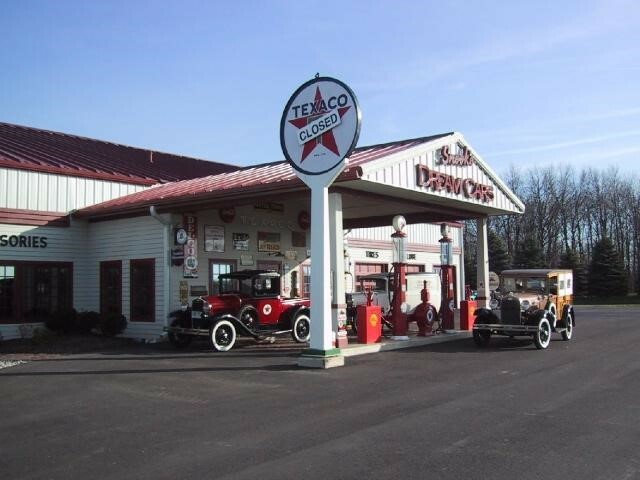 There is also a complete four-bay shop for maintaining collector cars, and a warehouse for collector car storage.This is a must-see in Northwest Ohio!